Ndifreke Effiong’s brace, a goal apiece from Wisdom Fernando and Mfon Udoh gave Akwa United a comprehensive 4-0 victory at the Nest of Champions against Kada City Football Club of Kaduna. Two goals separately from both halves gave the Promise Keepers a meteoric rise from 9th to 4th in Group B of the 2019 abridged Nigeria Professional Football League. 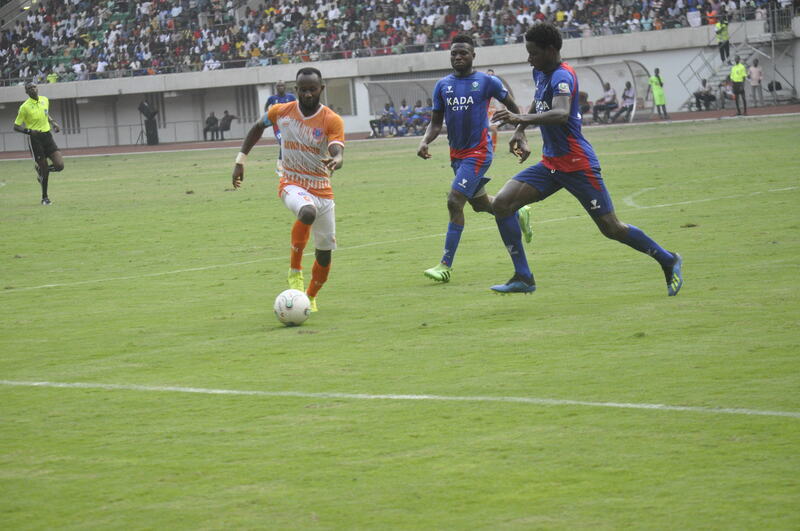 After running out with a 1-0 away victory against Yobe Desert Stars at Damaturu, Akwa began the match in Uyo with high pressing intensity from the blast of the whistle as forward men were toe-to-toe with Kada defenders forcing them to an error in the first minute of the game as Mfon Udoh clashed with the goalkeeper while rushing to meet with Ubong Friday’s cross. Their pressure paid off in the fifth minute when Mfon Udoh scored his fourth goal of the season after Ndifreke Effiong had slipped trying to convert Oshaniwa’s cross, but his effort met Mfon who had a tap in at the far post to give Akwa the early lead. Ubong Friday needed attention after clashing with a defender in the 10th minute of the game and was later replaced by Fernando in the 12th minute. The Uyo based side doubled their lead in the 33rd minute after having a fair share of possession. Right back, Etim Matthew met Denni Nya’s through ball to the near side, pulling out a fine cross with a little pullback for Ndifreke Effiong to fire in his first goal of the afternoon. Despite leading by 2 goals, The Promise Keepers kept the pressure on the visitors as one of Kada City’s defenders again failed to control the ball near his eighteen-yard box, but this time Mfon Udoh failed to punish them as his shot went wide. Kada City went for an attack of their own. Despite Nigerian international, Juwon Oshaniwa fumbling on the turf, Olisema came to his rescue to keep the ball out of harm’s way. After having their second substitution of the afternoon with Ubong Essien replaced for Christopher Lolo who was on a yellow card, Rafael Everton’s men scored two quick goals in the 63rd and 65th minutes. Substitute Fernando, scoring his first goal for The Promise Keepers and in Nigeria’s topflight league, with Ndifreke Effiong getting his brace of the afternoon, making it 4-0 for the home side. With the 2017 Aiteo Cup champions struggling to maintain the tempo of the game that produced the four goals, Kada City looked poised to grab a consolation goal as they hit the woodwork in the 73rd minute from a long range strike. It was time for Akwa’s third and final substitution as Alberico Da Silva’s Jersey no 8 was raised, rather than going off the pitch, the Brazilian midfielder was seeking the attention of the medics as he went to the ground, causing a row between players of both teams as the referee spotted only Oshaniwa for a Yellow. Two-time Federation Cup winners had another chance of adding to their tally after Ndifreke Effiong had drawn out a defender deceiving him to have controlled the ball only to let go for his strike partner Mfon Udoh whose pace was far beyond the defenders. The former Enyimba Captain with just Kada City’s goalie to beat watched his shot go wide, keeping the scoreline at 4-0. The win means Everton’s men have been able to maintain a 100% record in their last three games, scoring 8 goals without conceding any in the process.